Grevillea victoriae is impressive for the showy flowers and the full dense screen it provides. Grevillea victoriae has green foliage and red flowers. 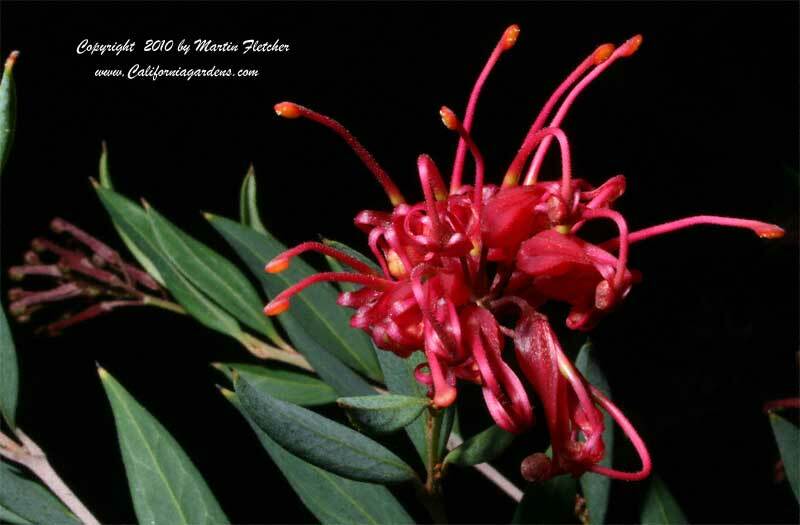 The Royal Grevillea grows to 8 feet or more tall and wide. Grevillea victoriae has done great in our plantings in spite of soggy Winter conditions, overhanging shade from some endlessly enthusiastic bamboo's and Winter temperatures dipping into the low teens. Grevillea victoriae blooms starting in late Spring and continuing for much of the Summer, often with a few blooms during the rest of the year. Drought made Grevillea victoriae thin but they have all survived and revived nicely when the rains returned. Red flowers and foliage of Grevillea victoriae - Royal Grevillea. High resolution photos are part of our garden image collection.